Hacking-Lab is an online service. No need to install hardware on premise! The portal page is the place where users sign in, get instructions, and submit their solutions. In a dedicated network, reachable with VPN, a large number of vulnerable servers is waiting to become exploited. We are using VM and docker technologies. The Attack-Defense system consists of many different machines and services, including a Jenkins Build server, scoring server, and several git repositories. Code changes committed by a team automatically trigger a build and deployment process. Each team owns a set of vulnerable applications. 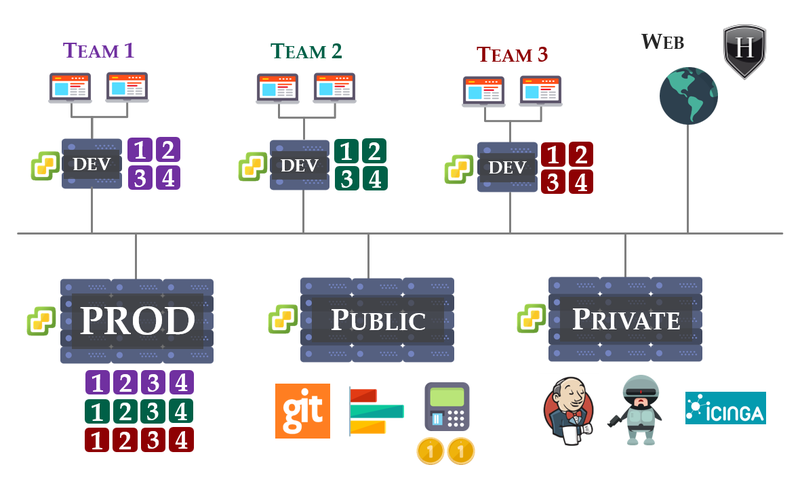 Every application is deployed twice: on a development and a production system.